From now until August 31st, the e-book version of The Organ Broker is on sale at Amazon and participating retailers for only $6.99, and for every copy sold the Arcade imprint of Skyhorse Publishing has agreed to donate one dollar to Donate Life America. Please join us. *Arcade Publishing, an imprint of Skyhorse Publishing, is donating a dollar to Donate Life America for every e-book of The Organ Broker sold until August 31, 2015. 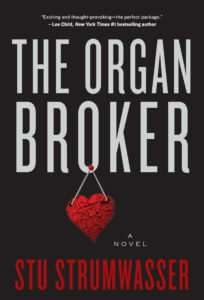 The Organ Broker is the thrilling and critically-acclaimed story of an underground black market organ dealer known as “New York Jack.” For eighteen years Jack has been a “transplant tourism director,” sending wealthy Americans and Europeans in need of kidneys and other organs to third world countries where they would buy them from transplant centers on the take. The death of a client and a newfound relationship lead to a crisis of conscience as he is forced to choose between a two million dollar commission—and participating in a murder. Jack races to South Africa, Brazil, and beyond, just one step ahead of his adversary and the FBI, in search of one small act of redemption. In 2006 Stu left Wall Street and founded Snow Beverages to make natural soda. He now runs Green Circle Capital, a boutique investment banking firm that specializes in health and wellness. Stu was born in Queens, raised in Lynbrook, and now resides in Brooklyn, New York with his two school-age, identical twin sons. Since he began conducting research for The Organ Broker in 2008 Stu became deeply concerned with the plight of what is now over 123,000 Americans on waiting lists for organs. He has become a passionate advocate for legislative changes to address the organ shortage crisis, worked with non-profits to create awareness, and published articles with proposed solutions in major online media including Salon and Everydayhealth. Learn more at www.theorganbroker.com. “Exciting and thought-provoking–the perfect package.” -Lee Child, NY Times # 1 bestselling author of the Jack Reacher series.